Boat Share or Syndication in Melbourne? Just join the Club! Think of a golf club and that’s what Pleasure Cruising Club is about. Instead of sharing a golf course with fellow members, you “boat share” a range of beautifully maintained cruisers. You deserve the best. What a special way to entertain family and friends on your cruiser for a day! 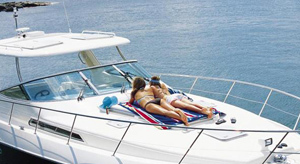 It’s so easy to go luxury boating in Melbourne with Pleasure Cruising Club. You choose what Pleasure Cruiser and membership you want, based on the number of boating days. You get to attend our skipper school, as well. After that, you can reserve the boat 24/7 through our internet reservation system. Once you reserve the boat, it’s all ready for you and nothing else to worry about. At the end of the day, no cleaning up needed. You just have to hand back the keys and walk away. How awesome is that?! Sharing your boat experience with family and friends couldn’t be more hassle-free. Over 200 lucky Australians,who could not afford a luxury boat in Melbourne or Sydney, have gained access to our shared luxury boats services since April 2007. So, join the club now for a low monthly subscription service and have the coveted lifestyle this season! Over this time the club has logged over 10,000 hours training members. Many boat share members who join the club are new to boating and joining the club and sharing a boat gives novice boaties the skill to go boating. It takes on average of 1.5 hours to clean our cruiser each time it’s used by our members. It can be cleaned twice a day. Each cruiser has to be vacuumed and washed down. Holding tanks need to be emptied and towels be changed. Safety checks are performed after every reservation. Every three months, the boats are “cut and polished” and our monthly check list has to be completed. Boat engines are serviced every one hundred hours. Corrosion from wear and tear means that there is always things to be done. It’s the club’s policy to hire school leavers and give them a go!